Susanna Fassetta was born and raised in Italy. In 1992 she moved to the Dominican Republic, with her English Thoroughbred to start a new chapter in life. Once settled, she realized the necessity to become proactive in helping and rescuing other horses in the region that were abused, abandoned and neglected. 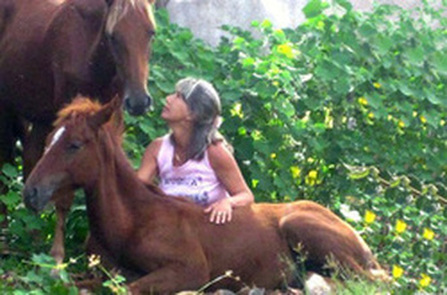 One by one, Susanna began adopting horses that needed a second chance. The horses were kept in a natural environment to ensure quality of life and assist with rehabilitation, forming the foundation of the Eden Ranch herd. The following is the story of her journey to horse-training and her personal discovery of what is known as the Liberty Training method. Upon studying in the US she learned extensively about natural horsemanship and other holistic methods to rehabilitate horses, to give them a better quality of life. She then began sharing this knowledge with others and started a teaching course for children to educate them of proper horse care, respect and love for the horses as well as nature. During her journey, she came across a few highly influential and spiritual mentors who deepened her desire for truth. She perfected her skills and bridged the gap between horse and human, which naturally manifested into a very strong spiritual connection. This founded the basis of her liberty training techniques and inspired her to found a school for teaching her method of natural horsemanship. The purchase of Eden Ranch in 2006 was the realization of her dream. Today, her property is open to like-minded guests who wish to immerse themselves in nature, thought, and direction in their own lives utilizing the horses as a gate to achieve true happiness. The following is the story of her journey to horse-training and her personal discovery of what is known as the Liberty Training method. When I bought my first horse, I had no idea that that decision would change my life forever. Empripjat was a beautiful 2 year-old thoroughbred, with a lot of problems. No one wanted to deal with her because she had too much energy and did not respond well to the traditional training methods. She was being kept at the stable that I rode, where the owner was attempting to train her. I remember staring into her eyes and seeing how miserable she looked. After a short time, I decided to buy Empripjat, so no one would force her to do anything against her will. Even with my little experience, one thing I knew for certain, she was not happy in captivity. So, I decided to give her freedom. I found a place where they would allow me to use a big paddock so that she could be outside most of the time and in the company of other four horses. I had no idea how to train horses at that time, except what I was observing from other people, which obviously didn’t work with her. So, I put aside my desire to ride her and sat in the paddock, with her, hoping to find a way to connect. In the beginning it was a bit painful to realize that she was enjoying her freedom and the other horses much more than my company, but I also realized that, after all, why should she care if I was the one to pay the bills for her maintenance? I chose to buy her, she never came to me and ask to be mine. By sitting there I had the chance to observe how she was interacting with the other horses. She looked totally comfortable and in charge of the situation. Most importantly, she looked happy and serene, like every horse should be. In a few days I started to recognize her signals through her body language, which was consistent according to different situations, and had a very clear response from the other horses. I saw that she could maneuver the other horses, but that they would not do the same to her. Obviously, she was higher in rank. During that time, I slowly realized how everything in the herd is related to personal space; how horses use certain kind of ceremonies in a precise etiquette, how they establish a harmonious way of living together, how they play and how they communicate with each other. I then thought that maybe I could reach to her by stepping into their world, using their language and code of etiquette, instead of asking her to think like a human. From that moment, she became my teacher, and the best I ever had. At first it felt a little awkward to try to behave like a horse, but I think that my career as an actress helped me a lot. I was used to being someone else, so why not trying to be a horse? It was fun to share her world, and she was constantly and efficiently giving me an immediate feedback, just like a good director. She would push me to study more, feel more, and improve in each movement. This is when the magic started to happen. She would welcome me every day into her small herd, with no expectation, and let me learn at my own pace. In a short time we could understand each other so easily, we could play and run together, rest together, sharing space, just feeling nature around us. We started to establish our private code and a completely new perception about horses unfolded right there, in front of me, like a beautiful golden door leading to an enchanted life. What I was experiencing became so fascinating that I decided to quit my career just to be with horses. At that time I also decided to leave Italy and to move with her to the Dominican Republic. The reality of this third world country led me to start to rescue horses and to learn new techniques. Once, I got a horse that was so completely fearful, skittish and distrustful, that I felt the need to seek professional help to teach me more about training horses. So, I went to Utah to study with Stan Allen, a great horseman who mainly deals with severely abused horses. What I learned from him was priceless, and only confirmed what I had been learning on my own. Again, it was all a matter of communicating with a horse through the code of the herd. It’s all about listening, with a pure heart and profound honesty, allowing a horse to be a horse, proud of him or herself, with no restrictions but those dictated by mutual respect. During all these years, I have refined my intuition and have acquired more and more confidence. I read and learned a lot from other trainers, but choosing only those techniques that would use liberty as the sole way to train horses. When I play with my horses there are no fences, no halters, no whips and no bits. Training is not sweating, obliging and using pressure. It is only and always fun. I now have a herd of 21 horses and every day adds a new discovery, a new game, and a chance to learn more. These horses are my best friends, who constantly show me how life can be simple and to always be happy, even in hard times. There is always a place in our heart for happiness, no matter what, and horses can be the best teachers in life if we are willing to listen. My gorgeous thoroughbred, Empripjat, passed away three years ago, after being together for 24 years. Her spirit is still on this land and still comes to me every time I sit down, sharing space with the herd.